Anytime you look into my fridge and not find at least three bunches of cleaned and arranged parsley, there's something wrong. This is probably the one item, well that and tomatoes and lemons, that I can't live without. 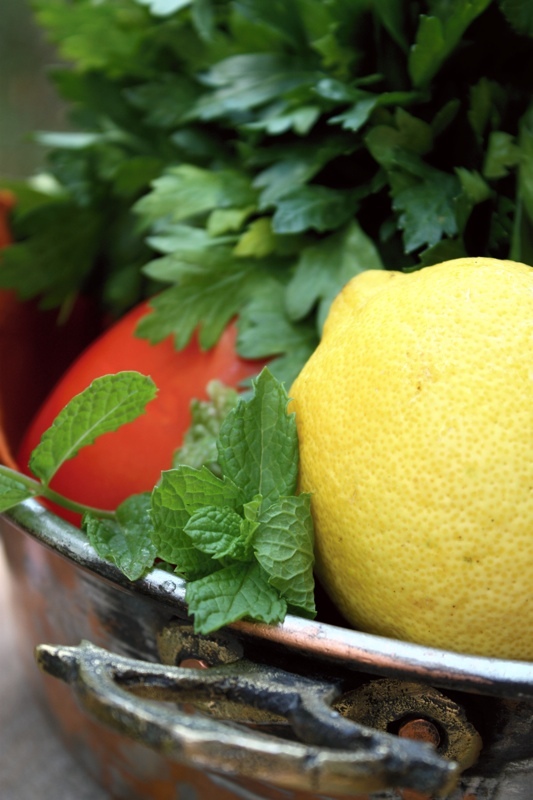 There are so many things to do with parsley - mix it with ground meat to make kafta, chop it for a parsley, onions, tomatoes and sumac salad, use it for fattoush, add it in my son's smoothie (more on that subject coming soon), and of course the Lebanese national salad: Tabbouleh! also spelled Tabooli, Tabbouli or Tabouli. It's become a stable on most American ethnic menus out there. With such variations as Quinoa Tabbouleh, Couscous Tabbouleh, Yes and even Almond Tabbouleh. For me, I love the classic, that is with fine cracked brown wheat. Although, the Quinoa version is also quite lovely. Now to the important part, the chopping. For this salad, everything is chopped, diced and sliced very fine. It is a challenge for the parsley, although with practice, you can come up with what works for you. The important thing to know is that once you mix the salad, the juices that start settling at the bottom of the bowl (which by the way are the absolute best part ever!! AH-sorry, mouth watering!) should not be green. If they are, that means you chopped the heck out of your parsley and the flavor changes. And one more thing, please under no circumstances should a food processor be used for that task. So, are you still interested to make it? Look, it's easy. The best advice to give you is to use a very sharp knife to avoid bruising the herbs and make the job much much easier. I personally prefer using a kyocera knife, because it cuts through a whole bunch of parsley with minimal pressure. And my favorite way to eat the salad is scooping it in lettuce leaves or endive. I'm about to get up and make another bowl (hmm, it's midnight. Definitely tomorrow). *Place the cracked wheat in a bowl, and cover with water and set aside. This will rehydrate the wheat to soften it and will avoid losing all the juices to the wheat and making the salad dry. 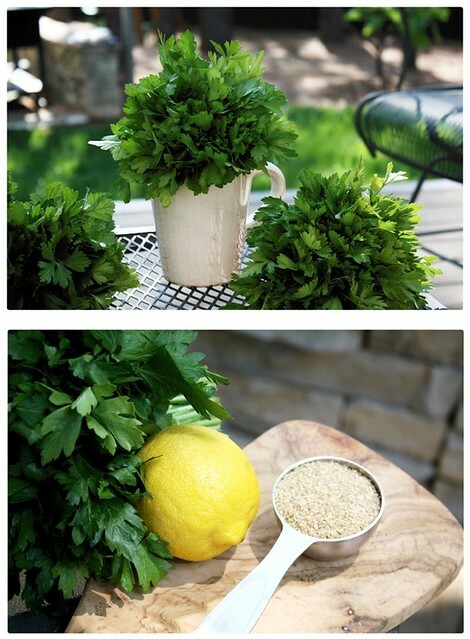 To arrange the parsley, remove the tie, then arrange the leaves side by side like a bouquet of freshly picked flowers. By doing this, it maximizes the usage of the parsley and avoids the use of the stems as much as possible. Once the whole bunch is arranged, tie it around with a rubber band or the tie that was originally used. That will keep it together until you're ready to chop. Remember to slide the knife onto the herbs only once. For the mint, pick the leaves and arrange in a pile, then chop finely. Dice the tomatoes and onion. Place all vegetables in a large bowl, drain the bulgur, squeeze out excess water in the palm of your hands, then add to the bowl. Add everything else and toss gently and until well incorporate. Chill for 30 minutes prior to serving. 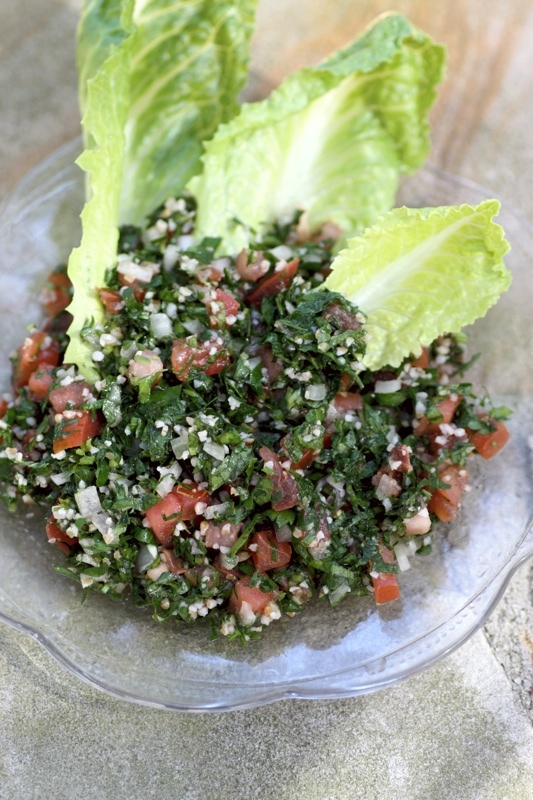 It's NEVER too late for good tabbouleh! Mmmmmyummyyy!!! My favorite :). I might just make some for lunch :):):):). Yum!!! Tabbouleh is my favorite. I agree with Jack. It's always the right time for tabbouleh. The tabbouleh looks DELICIOUS Anita, as all your recipes are. Mom and I wish we had a bowl in front of us right now!!!! How funny! I was thinking about reposting on tabbouleh! 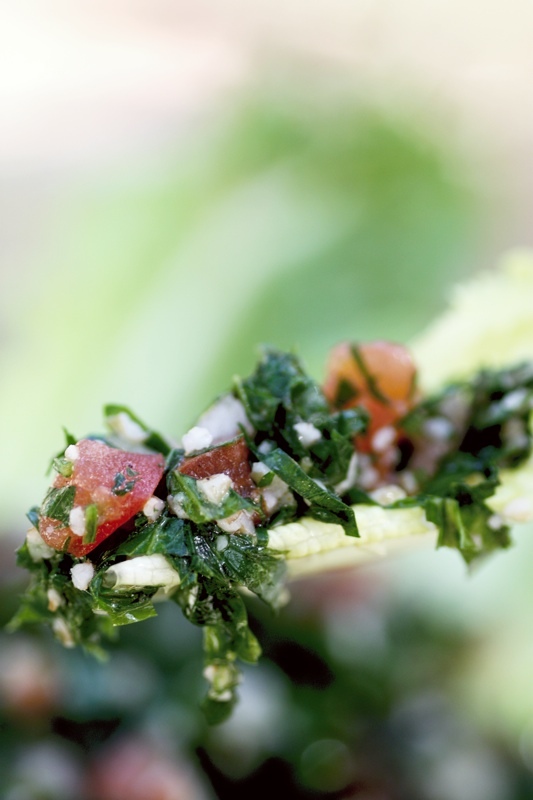 It is such an importantly healthy and delicious salad and ours to claim in Lebanese cuisine! Love your photos, they are so crisp and luminous! Copyright © Fresh Levant 2009-2014. All rights reserved. Powered by Blogger.